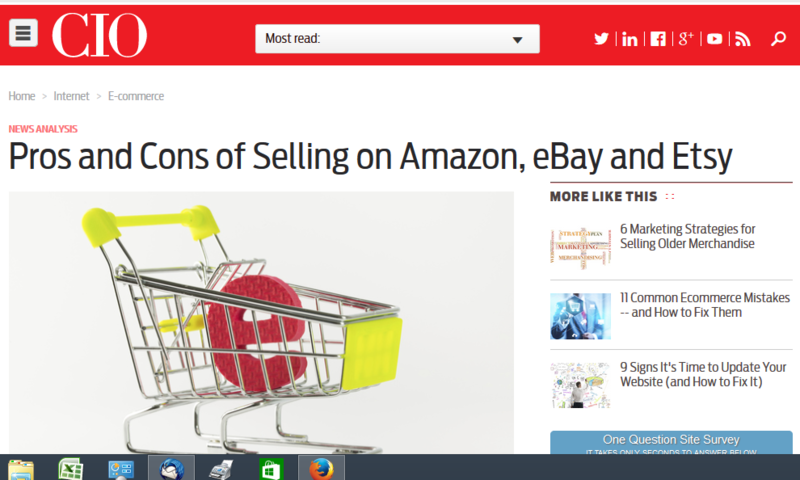 I was honored to be included today in an article published on CIO.com about the Pros and Cons of Selling on Amazon, eBay and Etsy. Dot Girl strives to provide the very best shopping service to all of our customers no matter how you find us on the web. This entry was posted in Dot Girl News on October 21, 2014 by kathy. Dot Girl Products is excited to be supporting the Total Children’s Wellness Fair held annually in Charlotte, North Carolina. Dot Girl is providing The Dot Girl First Period Kit as giveaway prizes along with ‘What’s Normal?’ bookmarks for tween girls attending the event. Interested in bookmarks for your event? Please let us know through our Contact Us page. This entry was posted in Dot Girl News, Events on October 15, 2014 by kathy. Dot Girl Products is dedicated to the mission of helping every girl have a positive first period experience. We applaud organizations that provide programs for young girls and schools – both private and public – that strive to provide health education for their students. We believe that the more accurate information a girl has about puberty and menstruation the better her chances are of growing into a confident, healthy woman. 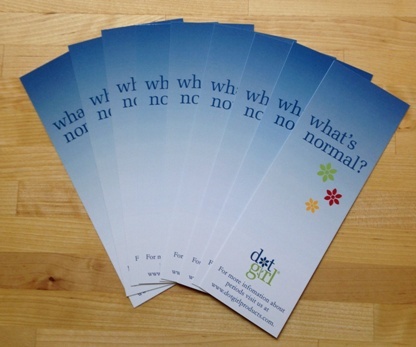 That’s why we’ve created the Dot Girl ‘What’s Normal?’ bookmark. Available for FREE to schools and non-profit organizations, the ‘What’s Normal?’ bookmark is designed to dispel some of the fears that girls have around menstruation. It can also be used as a way to open up a dialog between girls and their parents who may find it difficult to broach the subject of menstruation. Contact Dot Girl Products owner Kathy Pickus at kathy@dotgirlproducts to order bookmarks which will be shipped free of charge. This entry was posted in All Things Puberty, Dot Girl News, Health Topics on October 13, 2014 by kathy. Every once in a while I see a product and think “Now why didn’t I think of that?”. 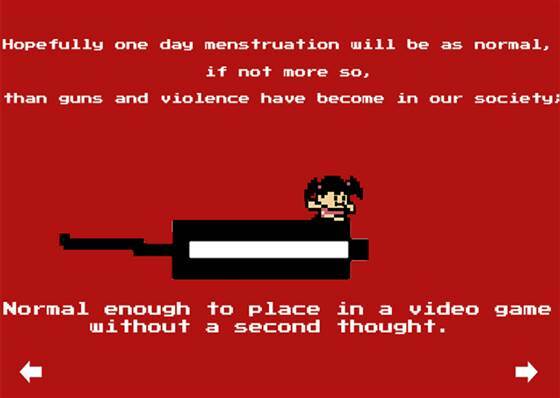 And that is exactly what I thought when I read about Tampon Run – the new video game that uses tampons instead of guns. Written by Andrea Gonzales and Sophie Houser, two young ladies attending a Girls Who Code program, the game has players collect tampons before the villains do. When attacked, players shoot tampons at the villains and who ever has tampons left over wins. Said Gonzales, “The idea of making it funny and quirky kind of makes menstruation a lot more approachable and more comfortable”. An idea that Dot Girl wholeheartedly supports. This entry was posted in Dot Girl Recommends, Random Thoughts on September 17, 2014 by kathy. The Women’s Health Foundation has launched their Below Your Belt initiative aimed at educating adolescent girls about all things ‘down there’. The initiative includes a community blog and soon to be released Below Your Belt book. The book will feature The Dot Girl First Period Kit as a suggested resource for educating girls about menstruation. This entry was posted in All Things Puberty, Health Topics on August 27, 2014 by kathy. Honored to be included along with a great set of period book recommendations by the wonderful A Mighty Girl website! Check out their site for book and product recommendations galore for girls including “That Time Of The Month”: Teaching Your Mighty Girl About Her Menstrual Cycle”. This entry was posted in All Things Puberty, Dot Girl Recommends on August 25, 2014 by kathy. We love finding fun, pretty and useful products to manage periods. Keep up to date with our recommendations and where to find them at the Dot Girl Period Products Board on Pinterest. This entry was posted in All Things Puberty, Dot Girl Recommends on August 20, 2014 by kathy. 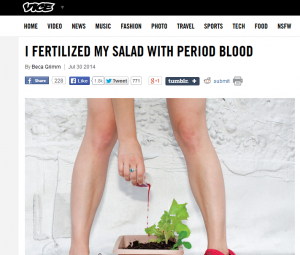 Fertilize Your Garden with Period Blood? Sometimes I run across something in the news that I am not sure is cool or gross – like the current movement of mothers eating their newborn babies placentas. 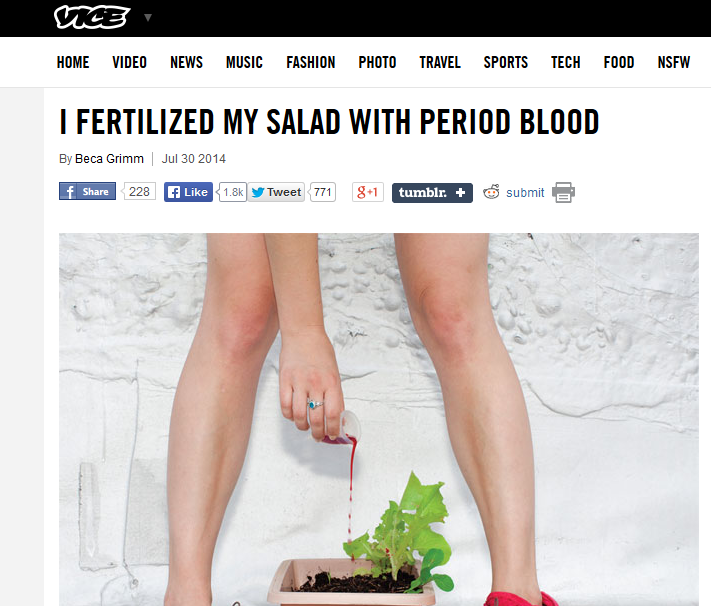 I think this article about fertilizing your garden with menstrual blood also falls into both categories. It’s great to be eco-friendly but I am going to leave it up to Dot Girl readers as to whether or not this is going a bit too far! This entry was posted in Health Topics, Random Thoughts on August 12, 2014 by kathy. Dot Girl announces a new partnership with Professional Leaders of Women and Girls (PLWG) – a network of dedicated leaders working together to hone their skills and abilities for working with girls. Founded by Kim Thomas, of Afro Puffs and Ponytails, the network is an online resource for business leaders to plan and execute programs that empower African American/black girls. Business Partners support the network through promotion of activities for girls and leaders and social media outreach. Dot Girl will be publishing articles on the PLWG website that educate girls about menstruation and offer suggestions on how leaders can integrate ‘period talk’ into programs. This entry was posted in Dot Girl News on August 11, 2014 by kathy. Zuzee, one of our favorite companies for girls, is sponsoring a #ZuzeeSummerDreamin’ Collage Contest to launch their new mobile app. Find out more about this great company and how your daughter can participate in the contest here. This entry was posted in Dot Girl Recommends, Events on July 29, 2014 by kathy. 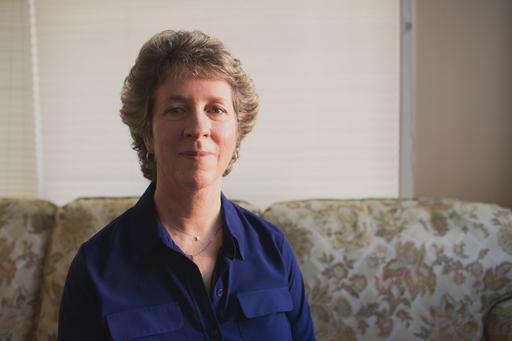 Hello, I am Kathy Pickus. I live in Mukilteo, WA and enjoy the fresh air and sunshine of the Pacific Northwest, with just a little bit of rain thrown in. 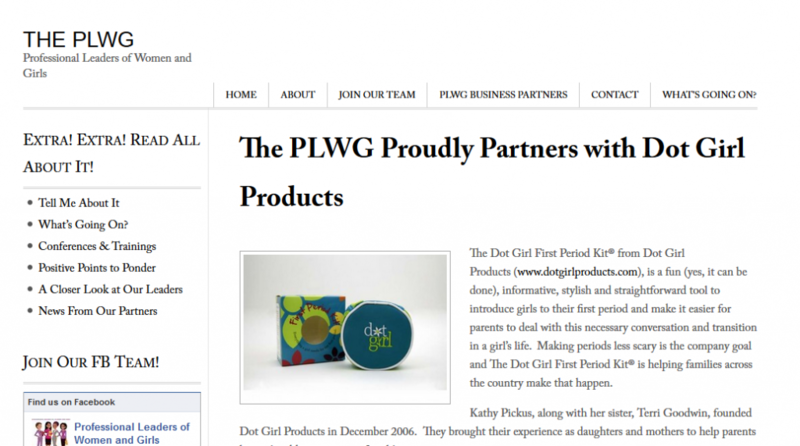 I founded Dot Girl Products™ in December of 2006 with the goal of helping parents explain menstruation to their daughters. I didn't know the first thing about periods when I started. By blogging and sharing information I hope to help you start the conversation with your daughter about puberty and other topics common to tween girls. The Dot Girl Blog has Moved! The Dot Girl Warm Pad - New and Improved!